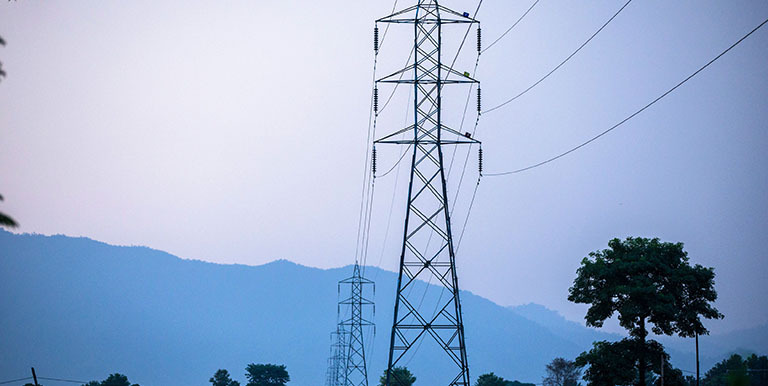 These transmission lines deliver electricity from Syanja to Butwal, Nepal. Photo credit: ADB. The Nepal power sector is at the threshold of a technology revolution. It is about to embrace the digital technology wave by implementing smart metering, which will allow it to enhance operational efficiency and implement a smart grid – a modernized electricity distribution system. While the drivers for implementing smart metering in Nepal are clear, several initiatives must be prioritized at the policy, regulatory, industry, institutional, and standardization level for the successful rollout of the program. This insight piece was adapted from Smart Metering Roap Map for Nepal. Nepal’s power sector faces many significant challenges due to inadequate power generation and poor distribution and transmission infrastructures because of years of underinvestment and delays in the sector reform. Most electricity demand in Nepal is met from installed hydropower generation capacity, owned either by the government’s Nepal Electricity Authority or by independent power producers. The country’s total potential to generate hydropower is estimated at 43,000 megawatts, however only 2% of which has been harnessed. Overall, the electricity demand has far outgrown the supply, leading to load curtailment and increased dependence on imports from India. About 63% of the population in Nepal has access to electricity but the supply quality is unreliable and inadequate. To mitigate these challenges, the Government of Nepal, through a loan from the Asian Development Bank in 2016, is undertaking various measures by pursuing energy sector reforms; increasing investment in the sector, including prioritizing development of alternative sources of energy, and promoting energy efficiency, among others; as well as achieving demand-side management. Under ABD’s Power Transmission and Distribution Efficiency Enhancement Project, the Nepal Electricity Authority is also planning to deploy about 100,000 smart meters and associated information technology systems to improve its operational efficiency. The electricity generation, transmission, and distribution landscape is changing drastically worldwide. The traditional model of generating electricity in large power plants and transmitting it over large distances before distributing it locally to end-consumers is no longer sufficient. Smart grid is the new mode of electricity distribution. It is a combination of modern power system technologies, power electronics, ICT, services, and regulatory structures, which enable sustainable management of environmental impacts in the power sector. It also covers increased integration of renewable energy; enhanced markets; enhanced efficiency, reliability and security; improved operation; and reduced costs. Smart grid enables consumers to actively participate in the power system not only as consumers but also as power producers with distributed generation and controlling power consumption. In this system, electricity will be fed into the grid from numerous injection points and will be consumed much nearer to the source of generation than in a traditional grid. For the National Electricity Authority to deploy a smart grid, it will have to implement smart metering, which will serve as the foundation for migration to the smart grid. Smart advanced metering infrastructure is an integrated system with communication networks and distribution management systems that enables two-way communication between utilities and customers. This is the interface of the customer to the utility electricity network. Once synched with the smart grid, the total solution links consumers and utilities by providing information on real-time consumption and supply data. The benefits of smart metering are not limited only to the Nepal Electricity Authority and go beyond various stakeholders. For the successful rollout of the smart metering program in Nepal, some core issues, constraints, and opportunities need special attention. Nepal has no national energy strategy and weak regulatory frameworks. The existing energy policy objectives were formulated as general 3-year plans by the central planning entity, the National Planning Commission. The Nepal Electricity Authority and other stakeholders should see to it that a regulatory framework for promoting innovation is established, that it supports transformation to a low-carbon energy ecosystem, and that it delivers sustainable, resilient, and affordable services to consumers. Nepal has an inadequate electricity infrastructure. This could hinder the rollout of smart metering by limiting the technologies and methodologies that vendors across Nepal might adopt during the rollout. The Government of Nepal has major financing responsibilities in many other sectors and might have limited resources to develop Nepal’s power sector infrastructure on its own. To ensure the full development of the power sector and leverage the investments made by the government, particularly where implementing advanced technologies like smart metering and smart grids is concerned, an innovative business model using public-private partnership (PPP) could also be explored. The Nepal Electricity Authority’s operational and financial performance must significantly improve, especially in the area of high-end technology, cybersecurity, and others. All processes, including meter reading, connection/disconnection, firmware upgrade, and meter maintenance, would need to be defined in detail to enable a successful rollout of smart metering. Nepal Electricity Authority will have to develop capability in areas such as metering, communication technologies for smart metering, IT applications (such as head-end and meter data management systems and analytics), system integration, and others. Nepal needs to develop a metering industry and subsequently transform into a large-scale supplier of smart meters at an affordable cost. Having manufacturing facilities in the country will also create jobs and develop a skilled workforce. Adequate opportunities must be provided to micro, small, and medium-sized enterprises and startups to supply smart meters and its enabling technologies. There is a need to support such companies to inject competition in terms of quality and cost, and subsequently develop a larger pool of smart meter manufacturers in the country. Success in the implementation of smart metering infrastructure is a step closer to smart grid. The smart metering rollout program is in its early stages. The target of Nepal Electricity Authority is to deploy 5 million smart meters in phases by 2025. Therefore, selecting the most suitable deployment architecture is pivotal. Forming a National Monitoring and Task Force Committee in charge of developing an implementation plan for smart metering and the smart grid and developing policy and regulatory framework updates is likewise recommended. Establishing new business processes for smart metering is also important. Nepal Electricity Authority will need to foster a culture in which its personnel can easily adopt new business processes. Asian Development Bank. 2018. Smart Metering Road Map for Nepal. Manila. ADB. Nepal: Power Transmission and Distribution Efficiency Enhancement Project. Jiwan Acharya works on developing and implementing energy efficiency, renewable energy, and other broader energy sector projects in India and Nepal. Prior to his current role, he was with Sector Advisory Support in the Sustainable Development and Climate Change Department of ADB as Senior Climate Change Specialist (Clean Energy). He is a key member of ADB's Energy Sector Group and Climate Change Team, responsible for overseeing ADB's several key initiatives including Energy for All and Low Carbon Technology Transfer. He also served as ADB’s focal point for Clean Technical Fund (CTF) and Scaling Up Renewable Energy for Low Income Countries (SREP) under the Climate Investment Funds (CIF) as well as the Sustainable Energy for All Initiative (SE4All).